I chose to focus my dissertation research on the impact of information and communication technologies (ICTs) during elections in repressive states. Why? Because the contentious relationship between state and society during elections is accentuated and the stakes are generally higher than periods in-between elections. To be sure, elections provide momentary opportunities for democratic change. Moreover, the impact of ICTs on competitive events such as contentious elections may be more observable than the impact on state-society relations during the regular calendar year. In other words, the use of ICTs during election periods may shed some light on whether said technologies empower coercive regimes at the expense of civil society or vice versa. While this map is not powered by the Ushahidi platform (contrary to this claim), the many similarities suggest that the project was inspired by the earlier nation-wide use of the Ushahidi platform in 2010, namely the Russia Fires Help Map. In fact, the major initiator of the Violations Map attended a presentation on Ushahidi and Help Map in Boston earlier this year. My colleague Alexey Sidorenko argues that the backlash against the Violations Map “induced the Streisand Effect, whereby any attempt to contain the spread of information results in the opposite reaction.” Indeed, as one Russian blogger tweeted: “Why are ‘United Russia’ representatives so short-sighted? 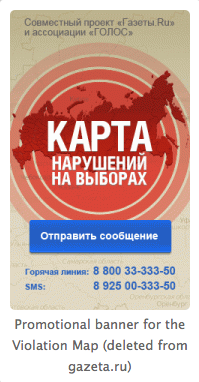 It is evident that now half of the country will know about the Violation Map.” Needless to say, the Violations Map is one of the trending topics being discussed in Russia today (on election day). 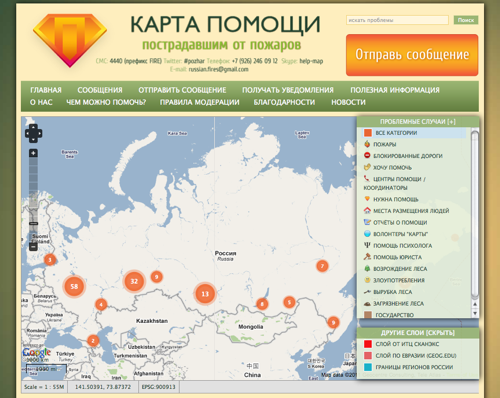 According to a Russian-speaking colleague of mine (who also pointed me to this pro-Kremlin activist video), the woman says that “mapping dots is a disease on the map of Russia.” The video shows her calling the Map’s dedicated number to report a false message (she gives a location that doesn’t exist) and subsequently fills out a false report online. In other words, this is an instructional video on how to submit false information to a crowdsourcing platform. A fully translated transcript of the video is available here. 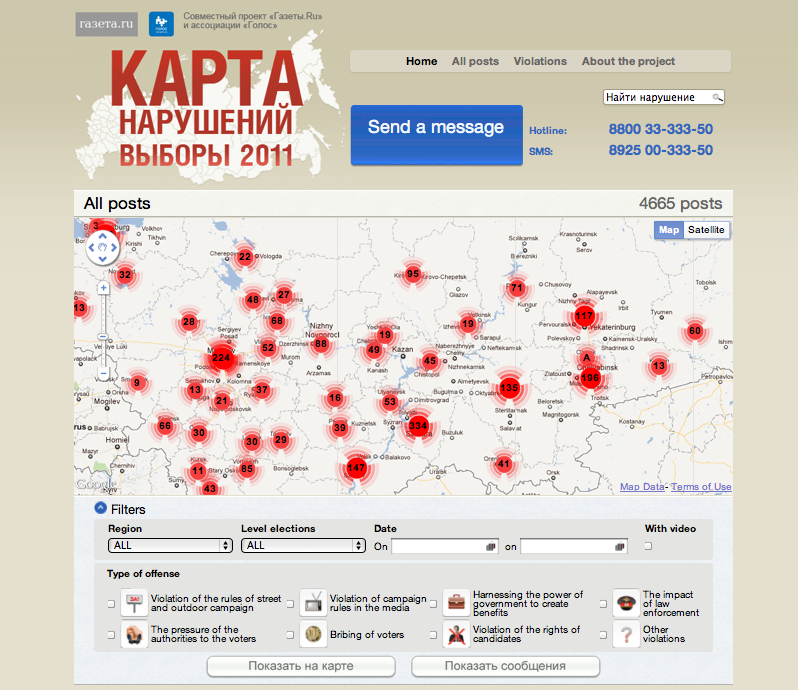 This same colleague informed me that one of Russia’s State Television Channels subsequently broadcast a program in which it accused those behind the Violations Map of making false claims about the falsification of reports, accusing the “Maptivists” of using an American tool in efforts against the Russian ruling party. In addition, the head of Russia’s Election Committee submitted a complaint against the map to the court, which resulted in the organizers receiving a $1,000 fine (30,0000 Rubles). Gregory Asmolov, a PhD student at LSE, argues that the Russian government’s nervous reaction to the crowdsourced map and its attempt to delegitimize and limit its presence in cyberspace is clear proof of the project’s impact. Gregory goes on to write that the crowdsourced map is an interim product, not a finished product, which serves as a diagnostic system in which individuals are the sensors. He also argues that crowdsourcing mirrors the reliability of society and thus claims that if there is low confidence in the reliability of crowdsourced information, this is a diagnosis of society and not the crowdsourcing tool itself. My dissertation research asked the following question: Do New ICTs Change the Balance of Power Between Repressive States and Civil Society? In the case of Russia’s Parliamentary Elections, it would seem so. So my next question is this: If Help Map inspired this week’s Election Violations Map, then what will the latter inspire now that many more have been exposed to the power of crowdsourcing and live maps? Stay tuned for the next round of Crowdsourcing vs. Putin. 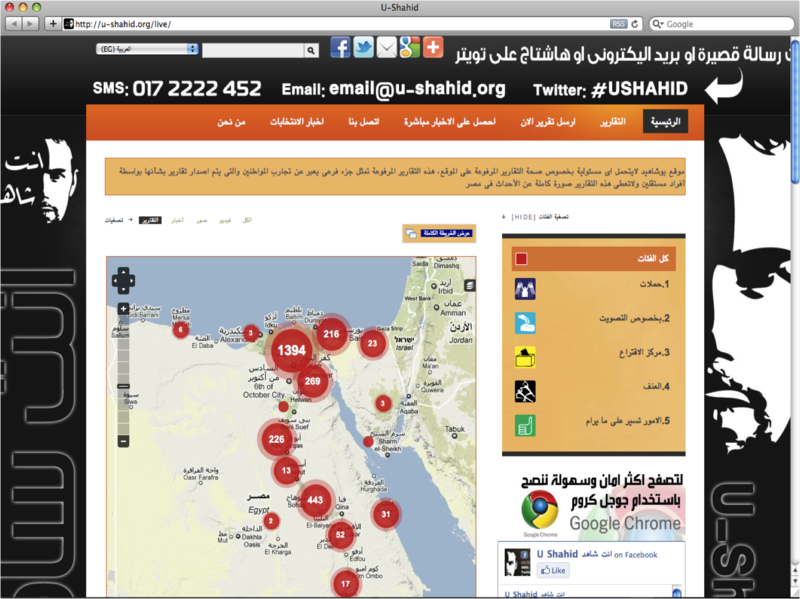 Quick, Stop All Ushahidi Deployments in Egypt! Has the world gone crazy? There are now at least five Ushahidi deployments in Egypt. Somebody stop this proliferation before things really gets out of control. This is ridiculous, who knows what could happen! Oh how I long for the days of expensive, proprietary software that prevented the widespread use of commercial platforms by the unwashed masses. Life was good back then, and simple. Only external organizations with millions of dollars of funding could monitor elections. Centralized, top-down hierarchical control was such a blessing. You’d think that those using Ushahidi in Egypt would at least make their deployments password protected. But no, they have the nerve to share their data publicly. The nerve. Someone please force these groups to use one (and only one) platform and to use a password. In fact, people should be required to apply for permission to use an Ushahidi platform by completing a 10-page form, providing 5 references along with a financial statement for the past 3 years. They should also sign a binding contract that obliges them not to share any data publicly. The golden rule should be one platform per country per year. All this needs to be controlled. Seriously, don’t people understand the consequences of democratizing tools for trans-parency and accountability? Just look at what’s happening in Eygpt. Ushahidi was never used in the country before the lead up to the country’s Parliamentary Elections. But now, because the platform is both free and open source, no fewer than 5 different groups have decided to add more transparency to the elections. How irresponsible is that? I mean, this is only going to give people more ideas on how to hold their government accountable in the future. Indeed, there may end up being twice as many platforms during the Presidential Elections next year as a result. And then what? This will just make each platform weaker since the data will be split across platforms. (Down with open data!). Don’t people understand that they can’t just do whatever they want? (Down with more choices!). Doesn’t anyone care about our rules anymore? The masses need to listen to us and do as we say. Oh how I do miss the good old days. Sigh. This careless proliferation of Ushahidi platforms in Egypt will only add more data (down with more data! 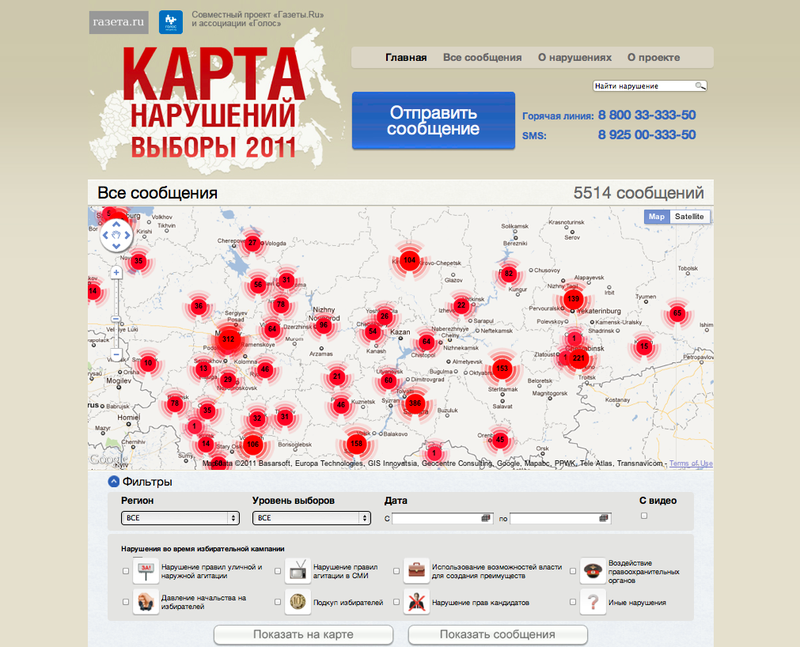 ), which means even more monitoring of the government’s actions during the elections (down with transparency!). The first Ushahidi platform that was launched already has 351 mapped reports and the other four platforms have already mapped a total of 461 reports. This is terrible. The additional data means that triangulating some reports may be possible, either manually or by using Swift River. This needless proliferation also means that many more issues will be monitored. At least the first Ushahidi platform that was launched didn’t have a specific category on women. But the platform launched by the Independent Coalition for Election Observation includes a category on women. And that platform is only in Arabic! Don’t people understand that election monitoring is supposed to be for English-speaking outsiders, i.e., the West? It gets worse. The Muslim Brotherhood is also using the platform to create more transparency around the elections. As the screenshot below reveals, they even have the audacity to monitor and map assaults on journalists, observers and human rights organizations. This is worse than blogging. But don’t get me started on blogs. The fact that anyone can blog is a travesty and an assault on everything we hold holly. The printing press? Don’t even go there. Again, has the world gone crazy? My ultimate nightmare, however, are APIs and RSS feeds. These allow data from different Ushahidi platforms to be easily shared. Just look at the screenshot below and you’ll understand my concerns. I was able to create one list of all reports simply by cutting and pasting the five website links into my Google Reader. This link will take you to a public website with one list of integrated reports from all five platforms updated in real-time. If you’d like to add this to your own Google Reader, use this Atom Feed. And if this isn’t disturbing enough, people can actually subscribe to automated email alerts of incoming reports based on specific areas of interest. I also hear a rumor that each Ushahidi platform comes with a unique key and that swapping keys allows for the automatic sharing of data between two or more Ushahidi platforms. Networked Ushahidi platforms. The nerve. Maybe the Egyptian government will be able to crack down on these platforms and curb this proliferation of transparency. After all, the US government has already invested billions of dollars to keep this repressive regime in power. My colleague Nils Weidmann recently moved to Princeton to start his post-doc with the Empirical Studies of Conflict group. Nils is always up to something interesting. 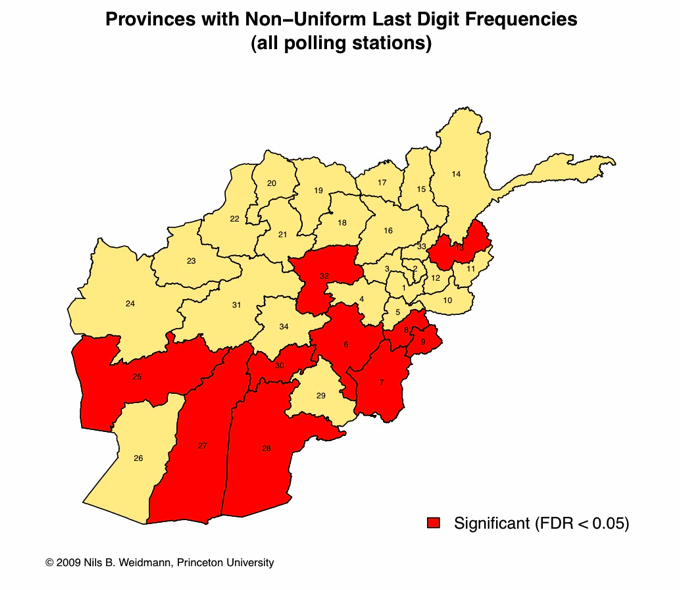 His latest research project focused on mapping election fraud in Afghanistan. Nils analyzed voter turn-out at voting stations using Beber and Scacco’s last digit method, which was used to analyze the Iran elections earlier this year. The method is very straightforward. In a free and fair election, the last digits (numbers “0” through “9”) for voting station turn-out should occur in equal frequency, i.e., should be “random.” Any non-randomness in this distribution may thus indicator manipulation. 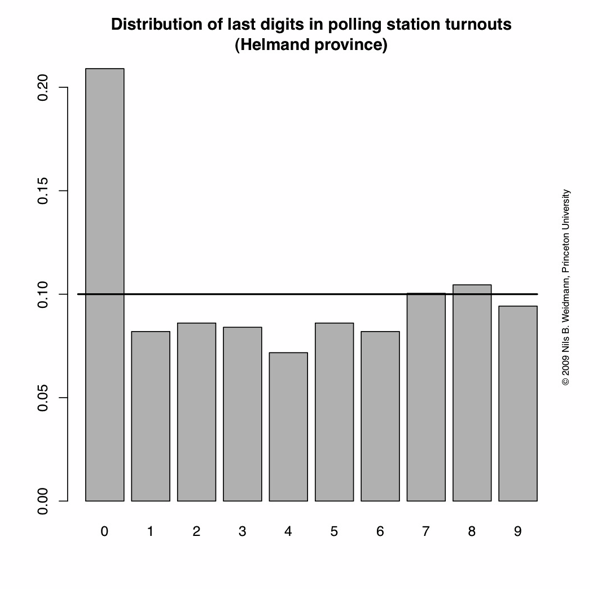 For example, the distribution below for Helmand province is clearly not random since the digit “0” occurs far more frequently than the other digits. 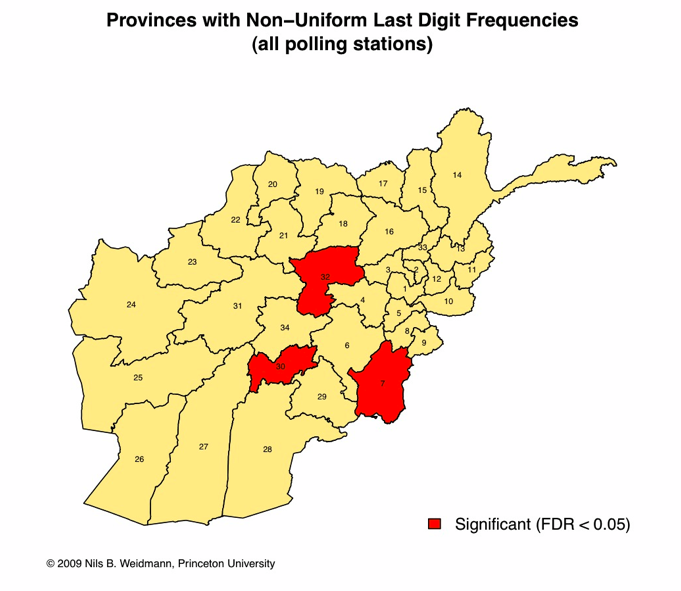 Provinces with non-random distribution of last digits for voting stations can then be mapped. As Nils points out, “despite the fact that the certified results contain almost no suspicious stations anymore, evidence of manipulation remains for four provinces.” See map below. Nils also produced spatial distribution maps for polling stations that had a higher number than the 600 voter count allocated and maps for polling stations with an overly high vote shares for one candidate. It would be great to super impose all the maps that Nils produced in order to compose a vote fraud probability index. I’d also be curious to know how projects by GeoCommons and Alive in Afghanistan might contribute to the research that Nils is pursuing, and vice versa. I’m very please to announce that the Ushahidi platform has been deployed at VoteReport.in to crowdsource the monitoring of India’s upcoming elections. The roll out followed our preferred model: an amazing group of Indian partners took the initiative to drive the project forward and are doing a superb job. I’m learning a lot from their strategic thinking. We’re also excited about developing Swift River as part of VoteReport India to apply a crowdsourcing approach to filter the incoming information for accuracy. This is of course all experimental and we’ll be learning a lot in the process. For a visual introduction to Swift River, please see Erik Hersman’s recent video documentary on our conversations on Swift River, which we had a few weeks ago in Orlando. You can read more about the project here and about the core team here. It really is an honor to be a part of this amazing group. We also have an official VoteReport blog here. 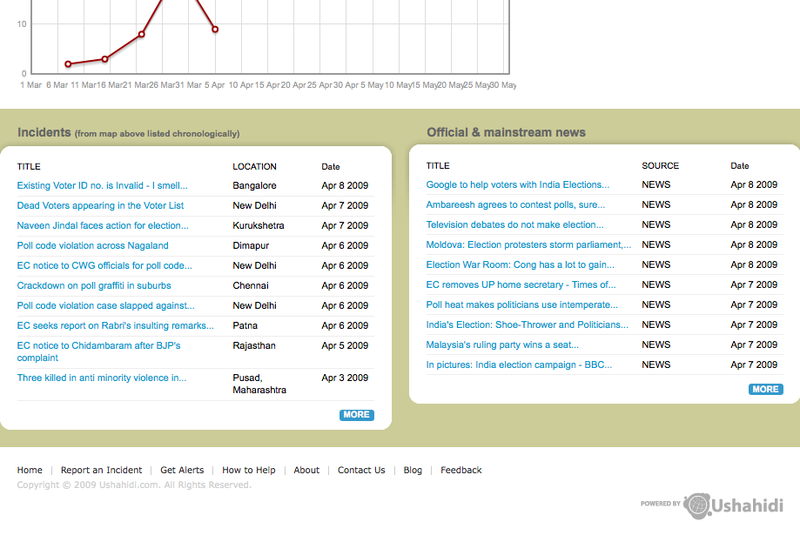 I also highly recommend reading Gaurav Mishra‘s blog post on VoteReport here and Ushahidi’s here. We’re thinking of using a different color to depict “All Categories” since red has cognitive connotations of violence and we don’t want this to be the first impression given by the map. I’m hoping we can add a “download feature” that will allow users to directly download the VoteReport data as a CSV file and as a KML Google Earth Layer. The latter will allow users to dynamically visualize VoteReports over space and time just like [I did here] with the Ushahidi data during the Kenyan elections.